Chairman of the Bashundhara Group Mr. Ahmed Akbar Sobhan said that eminent business and financial entities both local and international origin had started relocating inside the Bashundhara residential area seeing its rapid growth and the ultimate prospects. 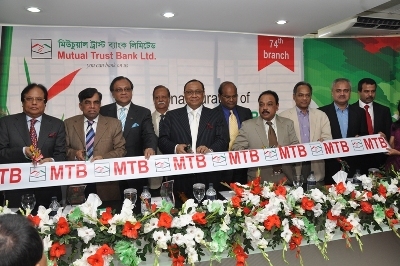 He was addressing as the chief guest at the inaugural function of 74th and Bashundhara Branch of the Mutual Trust Bank (MTB) at Block – B of the Bashundhara Residential Area this (Wednesday) morning. creating enormous potential for the financial institutions like bank. He thanked the MTB management for establishing the branch and said that presence of the bank uplifted the image of the housing project. wished the banks uninterrupted growth and suggested to concentrate more on cliental satisfaction as the basic key for expediting the achievement. He also suggested setting up exchange houses in strategically important cities around the world to enhance remittance inflow in the official channel. Mr. Sobhan recalled the assistance of the then Chairman of the National Credit and Commerce Bank (NCCB) Mr. Mujibul Haidar Chowdhury in implementing Bashundhara housing project and hoped that new generation bankers would too stand by the entrepreneurs in the years to come. Managing Director of the bank Anis A Khan, Directors Mr. Mahbob Morshed Hasan and Mr. Mohammad Wakiluddin also addressed the inaugural function. Acting Editor of the Dainik Kaler Kantho Mr. Imdadul Haque Milon, Acting Editor of the Dainik Bangladesh Protidin Mr. Noyeem Nizam among others present at the function. Later, Mr. Ahmed Akbar Sobhan declared Bashundhara Branch of the Mutual Trust Bank Limited open and switched on the functioning of the bank’s automated teller machine (ATM).